The SonoChiro® software automatically analyzes large numbers of full spectrum sound files to find the files that contain bat calls and then also classifies these files. The results of the classification is given as a list of the detected bats, their identity (genus and species), their behaviour (flight rhythm, social and hunting activity) and a confidence index of each identificaiton made. 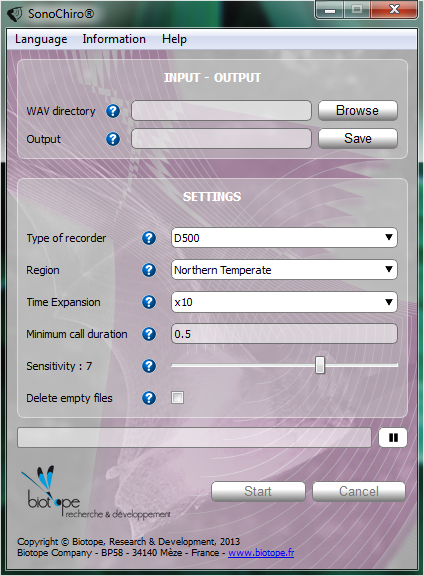 SonoChiro is particularly useful for analyzing the large number of sound files that can be obtained from automatically recording units, such as the D500X. SonoChiro is made by Biotope, France. French customers are referred to Biotope to purchase SonoChiro. More information about SonoChiro can be found at the Biotope web page.